The CitiDISK CompactFlash Digital Video Recorder from Shining Technology Inc. connects to FireWire-enabled camcorders to instantly capture footage digitally, eliminating the time-consuming process of digitizing DV/HDV/DVCProHD tapes or P2 cards into non-linear editing (NLE) systems. The recorder is an excellent solution to capture footage digitally and to tape simultaneously into QuickTime format through camera's viewfinder. At only 6oz, the recorder won't weigh you down even when undertaking strenuous activities such as trekking or mountaineering. The included 64GB solid state memory card provides reliability and plenty of storage space for your videos. Ultra-portable recorder with removable 64GB CompactFlash card included. 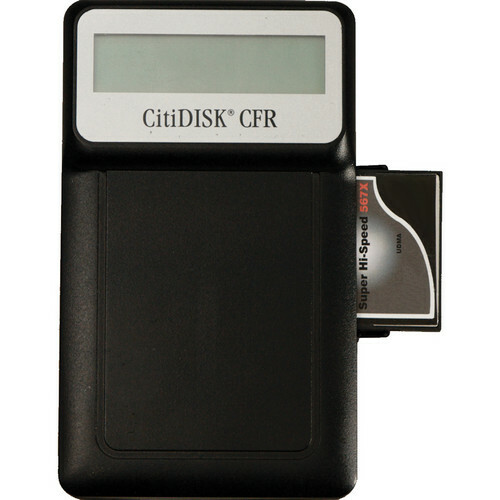 No moving parts, CitiDISK CFR recorder offers increased stability over traditional hard drives. Ideal for rough shooting conditions such as high-vibration, high altitude, or extreme weather. Optimized for broadcast and video professionals in the field. Automatically detects incoming MiniDV / DVCam / DVCPro (DV or DV25), HDV, DVCPro50 or DVCProHD stream formats and 2-ch-16-bit-48 kHz/2-ch-16-bit-44.1 kHz/4-ch-12-bit-32 kHz audio sampling rates. It also provides record/playback in either format. Video clips are stored as MOV, AVI2 or Canopus/Matrox AVI2 file format in a pre-formatted FAT32 medium for DV, DVCam, DVCPro, DVCPro50 & DVCProHD and M2T for HDV. "QPLAY" last captured DV footage on viewfinder when setting camera to VCR mode. Also navigate older clips at the press of a button or playlist from the local LCM+keys. Easily archive tape-based HDV or DV's footage by pressing CitiDISK CFR's REC button with camera in VCR mode. Video clips are stored as MOV, AVI2 or Canopus/Matrox AVI2 file format in a pre-formatted FAT32 medium for DV, DVCam, DVCPro, DVCPro50 & DVCProHD and M2T for HDV. DV footage buffered in internal memory and instantly recorded to unit's media when REC button is pressed or REC command is selected. This function helps prevent loss of footage. Built-in 150 minute rechargeable Lithium Polymer battery automatically takes over when 4.5-hour external battery runs low. This seamless battery power changeover ensures non-stop shooting capability - no need to shut down unit. With CompactFlash card inserted, CitiDISK CFR appears as an external FireWire hard drive on PC/Mac desktops via the miniUSB or FireWire port. Video clips are ready to be edited or played by most NLE software packages. Both "Quick Erase" and "Quick Format" functions can be also activated from local LCM and keys. Box Dimensions (LxWxH) 12.2 x 7.1 x 2.5"